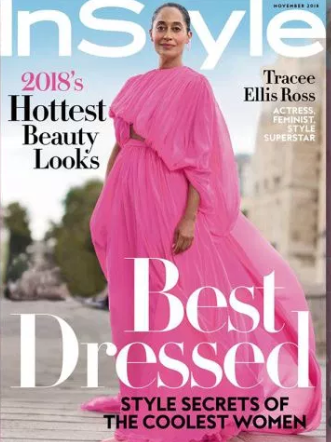 -In her InStyle cover story, Tracee Ellis Ross says she cool with her single status. “It’s sort of fascinating to be 45 and single and childless. [I’m] not at home crying about it.” Bless. Also, she really loves that colour and silhouette, no? She wore something similar to the MET Gala. And the Emmys. –Brad Pitt smiled at someone he was sitting near so clearly everyone thinks they’re dating. –Nicki Minaj now has merch based on her fight with Cardi B, which is both trashy and genius. –Jennifer Garner and Ben Affleck have finally finalized their divorce. If she waited for him to get healthy, that makes her a solid human being. –Lady Gaga has remained pretty opaque during this press tour (she must have gotten Bradley Cooper‘s memo), but her comments about sexual assault on last night’s Late Show were very articulate and personal. –Laurie Metcalf and Sara Gilbert say they have reached out to Roseanne Barr but didn’t hear back. -Every time Kate Beckinsale gets cutesy with her 23-year-old boyfriend, I want to fist pump. –R. Kelly‘s ex-wife says he once almost killed her in the backseat of a Hummer. –John Mulaney gives good talk show banter. –Suge Knight was sentenced to 28 years in prison for charges of murder and attempted murder.